Warn Halloween visitors to Enter If You Dare with this bloody cling decoration. 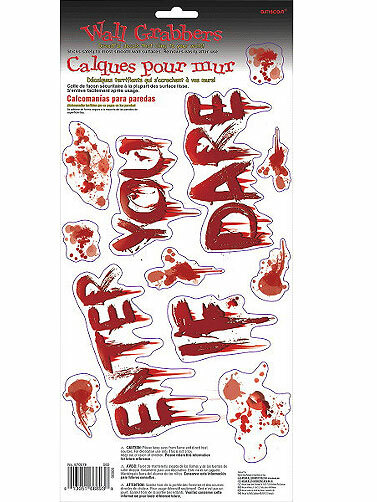 Bloody words Enter If You Dare are printed on soft plastic and includes blood smears and blood stains for a complete look. Reusable clings adhere to most smooth surfaces such as windows and doors and are easily removed without any sticky residue. Bloody Enter If You Dare Cling includes 12 pre-cut bloody clings on one sheet that measure 1.25 " x 1.25'' W to 5.25"W x 3"W.